These wonderful soft-sculptures are created by Peter Ray James. 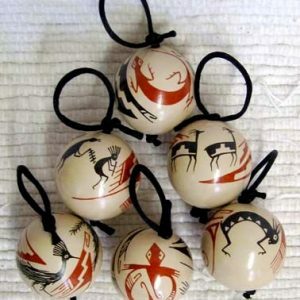 This Navajo man hand sews these small ornaments & stuffs them, then paints various designs on the pieces, finishes them by tying small branches to their sides or backs. 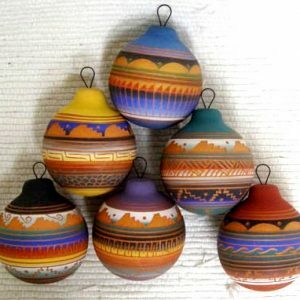 Each one is unique in design and painted colors. Each piece is signed by the atist, Peter Ray James. The Bear are believed to be very powerful & capable of curing illness. They are also considered great warriors. Yei bi chai. This Katsina is intended as a replica of the Navajo Talking God, the leader of the Yeibichai dancers who wear masks of the Yei & appear on the ninth & last night of the Navajo’s Nightway healing ceremony. The Hopi stage a Navajo Katsina Dance on First & Third Mesas, led by this Katsina. The corn plant signifies life and a prayer for a rich harvest. The horse or burro is a beast of burden & regarded as a member of the family for the Native people. 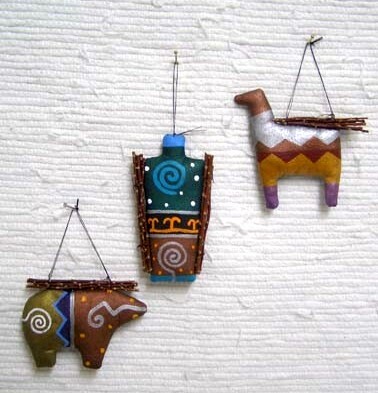 The bear & the horse ornament each measure 3.5 inches long. 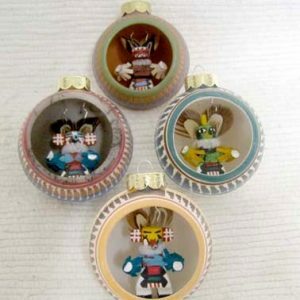 The “Yei” figure ornament is 4 inches tall. Price shown is for one. 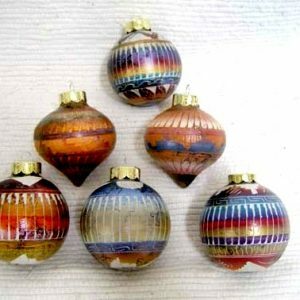 Each sculpture ornament is sold separately. Limited quantities available.